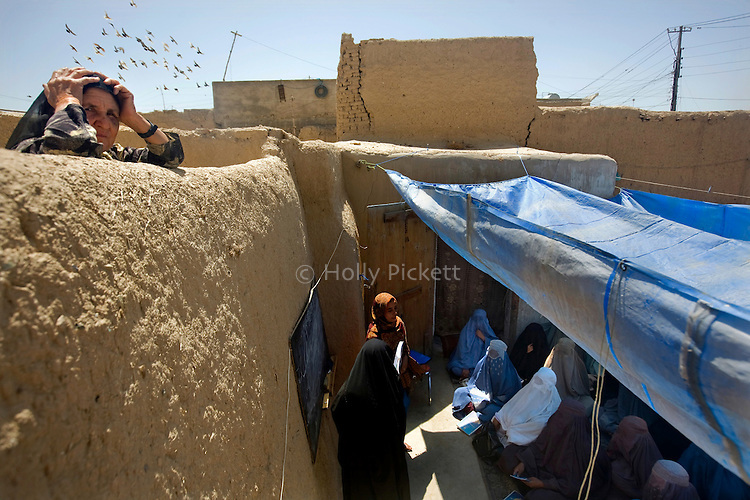 A neighbor peeks over the wall separating her house from the house where women and girls were learning the alphabet in Kandahar, Afghanistan, Tuesday morning, April 20, 2009. Security concerns prompt the girls to wear burqas when outsiders visit. In hopes of increasing women's literacy, a joint Canadian International Development Agency and World Food Program initiative exchanges a monthly ration of food for each student's attendance in the class. Deteriorating security and a shortage of schools for girls have prompted hundreds of discreet schools to spring up in Kandahari homes.